This article is about large-scale production. For the creation of matter, see mass generation. For other uses, see Mass Production (disambiguation). 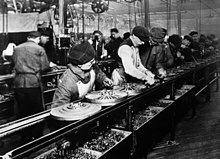 The term mass production was popularized by a 1926 article in the Encyclopædia Britannica supplement that was written based on correspondence with Ford Motor Company. The New York Times used the term in the title of an article that appeared before publication of the Britannica article. The concepts of mass production are applied to various kinds of products, from fluids and particulates handled in bulk (such as food, fuel, chemicals, and mined minerals) to discrete solid parts (such as fasteners) to assemblies of such parts (such as household appliances and automobiles). Mass production is a diverse field, but it can generally be contrasted with craft production or distributed manufacturing. Some mass production techniques, such as standardized sizes and production lines, predate the Industrial Revolution by many centuries; however, it was not until the introduction of machine tools and techniques to produce interchangeable parts were developed in the mid 19th century that modern mass production was possible. Mass production involves making many copies of products, very quickly, using assembly line techniques to send partially complete products to workers who each work on an individual step, rather than having a worker work on a whole product from start to finish. Bulk materials such as coal, ores, grains and wood chips are handled by belt, chain, slat, pneumatic or screw conveyors, bucket elevators and mobile equipment such as front-end loaders. Materials on pallets are handled with forklifts. Also used for handling heavy items like reels of paper, steel or machinery are electric overhead cranes, sometimes called bridge cranes because they span large factory bays. Mass production is capital intensive and energy intensive, as it uses a high proportion of machinery and energy in relation to workers. It is also usually automated while total expenditure per unit of product is decreased. However, the machinery that is needed to set up a mass production line (such as robots and machine presses) is so expensive that there must be some assurance that the product is to be successful to attain profits. One of the descriptions of mass production is that "the skill is built into the tool", which means that the worker using the tool may not need the skill. For example, in the 19th or early 20th century, this could be expressed as "the craftsmanship is in the workbench itself" (not the training of the worker). Rather than having a skilled worker measure every dimension of each part of the product against the plans or the other parts as it is being formed, there were jigs ready at hand to ensure that the part was made to fit this set-up. It had already been checked that the finished part would be to specifications to fit all the other finished parts—and it would be made more quickly, with no time spent on finishing the parts to fit one another. Later, once computerized control came about (for example, CNC), jigs were obviated, but it remained true that the skill (or knowledge) was built into the tool (or process, or documentation) rather than residing in the worker's head. This is the specialized capital required for mass production; each workbench and set of tools (or each CNC cell, or each fractionating column) is different (fine-tuned to its task). Standardized parts and sizes and factory production techniques were developed in pre-industrial times; however, before the invention of machine tools the manufacture of precision parts, especially metal ones, was very labor-intensive. Crossbows made with bronze parts were produced in China during the Warring States period. The Qin Emperor unified China at least in part by equipping large armies with these weapons, which were equipped with a sophisticated trigger mechanism made of interchangeable parts. Ships of war were produced on a large scale at a moderate cost by the Carthaginians in their excellent harbors, allowing them to efficiently maintain their control of the Mediterranean. The Venetians themselves also produced ships using prefabricated parts and assembly lines many centuries later. The Venetian Arsenal apparently produced nearly one ship every day, in what was effectively the world's first factory which, at its height, employed 16,000 people. Mass production in the publishing industry has been commonplace since the Gutenberg Bible was published using a printing press in the mid-15th century. In the Industrial Revolution simple mass production techniques were used at the Portsmouth Block Mills in England to make ships' pulley blocks for the Royal Navy in the Napoleonic Wars. It was achieved in 1803 by Marc Isambard Brunel in cooperation with Henry Maudslaym under the management of Sir Samuel Bentham. The first unmistakable examples of manufacturing operations carefully designed to reduce production costs by specialized labour and the use of machines appeared in the 18th century in England. A pulley block for rigging on a sailing ship. By 1808, annual production in Portsmouth reached 130,000 blocks. So that ten men, by the aid of this machinery, can accomplish with uniformity, celerity and ease, what formerly required the uncertain labour of one hundred and ten. By 1808, annual production from the 45 machines had reached 130,000 blocks and some of the equipment was still in operation as late as the mid-twentieth century. Mass production techniques were also used to rather limited extent to make clocks and watches, and to make small arms, though parts were usually non-interchangeable. Though produced on a very small scale, Crimean War gunboat engines designed and assembled by John Penn of Greenwich are recorded as the first instance of the application of mass production techniques (though not necessarily the assembly-line method) to marine engineering. In filling an Admiralty order for 90 sets to his high-pressure and high-revolution horizontal trunk engine design, Penn produced them all in 90 days. He also used Whitworth Standard threads throughout. Prerequisites for the wide use of mass production were interchangeable parts, machine tools and power, especially in the form of electricity. Some of the organizational management concepts needed to create 20th-century mass production, such as scientific management, had been pioneered by other engineers (most of whom are not famous, but Frederick Winslow Taylor is one of the well-known ones), whose work would later be synthesized into fields such as industrial engineering, manufacturing engineering, operations research, and management consultancy. Although after leaving the Henry Ford Company which was rebranded as Cadillac and later was awarded the Dewar Trophy in 1908 for creating interchangeable mass-produced precision engine parts, Henry Ford downplayed the role of Taylorism in the development of mass production at his company. However, Ford management performed time studies and experiments to mechanize their factory processes, focusing on minimizing worker movements. The difference is that while Taylor focused mostly on efficiency of the worker, Ford also substituted for labor by using machines, thoughtfully arranged, wherever possible. In 1807, Eli Terry was hired to produce 4,000 wooden movement clocks in the Porter Contract. At this time, the annual yield for wooden clocks did not exceed a few dozen on average. Terry developed a Milling machine in 1795, in which he perfected Interchangeable parts. In 1807, Terry developed a spindle cutting machine, which could produce multiple parts at the same time. Terry hired Silas Hoadley and Seth Thomas to work the Assembly line at the facilities. The Porter Contract was the first contract which called for mass production of clock movements in history. In 1815, Terry began mass producing the first shelf clock. Chauncey Jerome, an apprentice of Eli Terry mass produced up to 20,000 brass clocks annually in 1840 when he invented the cheap 30 hour OG clock. The United States Department of War sponsored the development of interchangeable parts for guns produced at the arsenals at Springfield, Massachusetts and Harpers Ferry, Virginia (now West Virginia) in the early decades of the 19th century, finally achieving reliable interchangeability by about 1850. This period coincided with the development of machine tools, with the armories designing and building many of their own. Some of the methods employed were a system of gauges for checking dimensions of the various parts and jigs and fixtures for guiding the machine tools and properly holding and aligning the work pieces. This system came to be known as armory practice or the American system of manufacturing, which spread throughout New England aided by skilled mechanics from the armories who were instrumental in transferring the technology to the sewing machines manufacturers and other industries such as machine tools, harvesting machines and bicycles. Singer Manufacturing Co., at one time the largest sewing machine manufacturer, did not achieve interchangeable parts until the late 1880s, around the same time Cyrus McCormick adopted modern manufacturing practices in making harvesting machines. Mass production benefited from the development of materials such as inexpensive steel, high strength steel and plastics. Machining of metals was greatly enhanced with high speed steel and later very hard materials such as tungsten carbide for cutting edges. Fabrication using steel components was aided by the development of electric welding and stamped steel parts, both which appeared in industry in about 1890. Plastics such as polyethylene, polystyrene and polyvinyl chloride (PVC) can be easily formed into shapes by extrusion, blow molding or injection molding, resulting in very low cost manufacture of consumer products, plastic piping, containers and parts. An influential article that helped to frame and popularize the 20th century's definition of mass production appeared in a 1926 Encyclopædia Britannica supplement. The article was written based on correspondence with Ford Motor Company and is sometimes credited as the first use of the term. Electrification of factories began very gradually in the 1890s after the introduction of a practical DC motor by Frank J. Sprague and accelerated after the AC motor was developed by Galileo Ferraris, Nikola Tesla and Westinghouse, Mikhail Dolivo-Dobrovolsky and others. Electrification of factories was fastest between 1900 and 1930, aided by the establishment of electric utilities with central stations and the lowering of electricity prices from 1914 to 1917. Electric motors were several times more efficient than small steam engines because central station generation were more efficient than small steam engines and because line shafts and belts had high friction losses. Electric motors allowed also more flexibility in manufacturing and required less maintenance than line shafts and belts. Many factories saw a 30% increase in output just from changing over to electric motors. Electrification enabled modern mass production, as with Thomas Edison’s iron ore processing plant (about 1893) that could process 20,000 tons of ore per day with two shifts of five men each. At that time it was still common to handle bulk materials with shovels, wheelbarrows and small narrow gauge rail cars, and for comparison, a canal digger in previous decades typically handled 5 tons per 12-hour day. The biggest impact of early mass production was in manufacturing everyday items, such as at the Ball Brothers Glass Manufacturing Company, which electrified its mason jar plant in Muncie, Indiana, U.S. around 1900. The new automated process used glass blowing machines to replace 210 craftsman glass blowers and helpers. A small electric truck was used to handle 150 dozen bottles at a time where previously a hand truck would carry 6 dozen. Electric mixers replaced men with shovels handling sand and other ingredients that were fed into the glass furnace. An electric overhead crane replaced 36 day laborers for moving heavy loads across the factory. The provision of a whole new system of electric generation emancipated industry from the leather belt and line shaft, for it eventually became possible to provide each tool with its own electric motor. This may seem only a detail of minor importance. In fact, modern industry could not be carried out with the belt and line shaft for a number of reasons. The motor enabled machinery to be arranged in the order of the work, and that alone has probably doubled the efficiency of industry, for it has cut out a tremendous amount of useless handling and hauling. The belt and line shaft were also tremendously wasteful – so wasteful indeed that no factory could be really large, for even the longest line shaft was small according to modern requirements. Also high speed tools were impossible under the old conditions – neither the pulleys nor the belts could stand modern speeds. Without high speed tools and the finer steels which they brought about, there could be nothing of what we call modern industry. The assembly plant of the Bell Aircraft Corporation in 1944. Note parts of overhead crane at both sides of photo near top. Mass production was popularized in the late 1910s and 1920s by Henry Ford's Ford Motor Company, which introduced electric motors to the then-well-known technique of chain or sequential production. Ford also bought or designed and built special purpose machine tools and fixtures such as multiple spindle drill presses that could drill every hole on one side of an engine block in one operation and a multiple head milling machine that could simultaneously machine 15 engine blocks held on a single fixture. 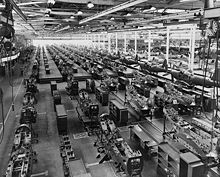 All of these machine tools were arranged systematically in the production flow and some had special carriages for rolling heavy items into machining position. Production of the Ford Model T used 32,000 machine tools. 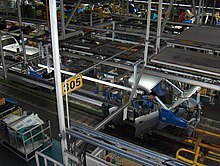 Mass production systems for items made of numerous parts are usually organized into assembly lines. The assemblies pass by on a conveyor, or if they are heavy, hung from an overhead crane or monorail. Ford built the Ford River Rouge Complex with the idea of making the company's own iron and steel in the same large factory site as parts and car assembly took place. River Rouge also generated its own electricity. Upstream vertical integration, such as to raw materials, is away from leading technology toward mature, low return industries. Most companies chose to focus on their core business rather than vertical integration. This included buying parts from outside suppliers, who could often produce them as cheaply or cheaper. Standard Oil, the major oil company in the 19th century, was vertically integrated partly because there was no demand for unrefined crude oil, but kerosene and some other products were in great demand. The other reason was that Standard Oil monopolized the oil industry. The major oil companies were, and many still are, vertically integrated, from production to refining and with their own retail stations, although some sold off their retail operations. Some oil companies also have chemical divisions. Lumber and paper companies at one time owned most of their timber lands and sold some finished products such as corrugated boxes. The tendency has been to divest of timber lands to raise cash and to avoid property taxes. The economies of mass production come from several sources. The primary cause is a reduction of non-productive effort of all types. In craft production, the craftsman must bustle about a shop, getting parts and assembling them. He must locate and use many tools many times for varying tasks. In mass production, each worker repeats one or a few related tasks that use the same tool to perform identical or near-identical operations on a stream of products. The exact tool and parts are always at hand, having been moved down the assembly line consecutively. The worker spends little or no time retrieving and/or preparing materials and tools, and so the time taken to manufacture a product using mass production is shorter than when using traditional methods. The probability of human error and variation is also reduced, as tasks are predominantly carried out by machinery; error in operating such machinery, however, has more far-reaching consequences. A reduction in labour costs, as well as an increased rate of production, enables a company to produce a larger quantity of one product at a lower cost than using traditional, non-linear methods. However, mass production is inflexible because it is difficult to alter a design or production process after a production line is implemented. Also, all products produced on one production line will be identical or very similar, and introducing variety to satisfy individual tastes is not easy. However, some variety can be achieved by applying different finishes and decorations at the end of the production line if necessary. The starter cost for the machinery can be expensive so the producer must be sure it sells or the producers will lose a lot of money. The Ford Model T produced tremendous affordable output but was not very good at responding to demand for variety, customization, or design changes. As a consequence Ford eventually lost market share to General Motors, who introduced annual model changes, more accessories and a choice of colors. With each passing decade, engineers have found ways to increase the flexibility of mass production systems, driving down the lead times on new product development and allowing greater customization and variety of products. In the 1830s, French political thinker and historian Alexis de Tocqueville identified one of the key characteristics of America that would later make it so amenable to the development of mass production: the homogeneous consumer base. De Tocqueville wrote in his Democracy in America (1835) that "The absence in the United States of those vast accumulations of wealth which favor the expenditures of large sums on articles of mere luxury... impact to the productions of American industry a character distinct from that of other countries' industries. [Production is geared toward] articles suited to the wants of the whole people". Mass production improved productivity, which was a contributing factor to economic growth and the decline in work week hours, alongside other factors such as transportation infrastructures (canals, railroads and highways) and agricultural mechanization. These factors caused the typical work week to decline from 70 hours in the early 19th century to 60 hours late in the century, then to 50 hours in the early 20th century and finally to 40 hours in the mid-1930s. Mass production permitted great increases in total production. Using a European crafts system into the late 19th century it was difficult to meet demand for products such as sewing machines and animal powered mechanical harvesters. By the late 1920s many previously scarce goods were in good supply. One economist has argued that this constituted "overproduction" and contributed to high unemployment during the Great Depression. Say's law denies the possibility of general overproduction and for this reason classical economists deny that it had any role in the Great Depression. Mass production allowed the evolution of consumerism by lowering the unit cost of many goods used. ^ Production Methods, BBC GCSE Bitesize, retrieved 2012-10-26. ^ "Portsmouth Royal Dockyard Historical Trust: History 1690 - 1840". portsmouthdockyard.org. ^ Osborn, G.A. (1965). "The Crimean War gunboats, part 1". The Mariner's Mirror. 51 (2): 103–116. doi:10.1080/00253359.1965.10657815. ^ Roberts, Kenneth D., and Snowden Taylor. Eli Terry and the Connecticut Shelf Clock. Ken Roberts Publishing, 1994. ^ Jerome, Harry (1934). Mechanization in Industry, National Bureau of Economic Research. p. xxviii. ^ Devine, Jr., Warren D. (1983). "From Shafts to Wires: Historical Perspective on Electrification, Journal of Economic History, Vol. 43, Issue 2" (PDF): 355. ^ Smil, Vaclav (2005). Creating the Twentieth Century: Technical Innovations of 1867-1914 and Their Lasting Impact. Oxford and New York: Oxford University Press. ^ Nye, David E. (1990). Electrifying America: Social Meanings of a New Technology. Cambridge, Massachusetts and London, England: MIT Press. pp. 14, 15. ^ Ford, Henry; Crowther, Samuel (1930). Edison as I Know Him. New York: Cosmopolitan Book Company. p. 15 (on line edition). ^ Womack, Jones, Roos; The Machine That Changed The World, Rawson & Associates, New York. Published by Simon & Schuster, 1990. ^ Beaudreau, Bernard C. (1996). Mass Production, the Stock Market Crash and the Great Depression: The Macroeconomics of Electrification. New York, Lincoln, Shanghi: Authors Choice Press. Beaudreau, Bernard C. (1996). Mass Production, the Stock Market Crash and the Great Depression. New York, Lincoln, Shanghi: Authors Choice Press. Borth, Christy. Masters of Mass Production, Bobbs-Merrill Company, Indianapolis, IN, 1945. Herman, Arthur. Freedom's Forge: How American Business Produced Victory in World War II, Random House, New York, NY, 2012. ISBN 978-1-4000-6964-4.